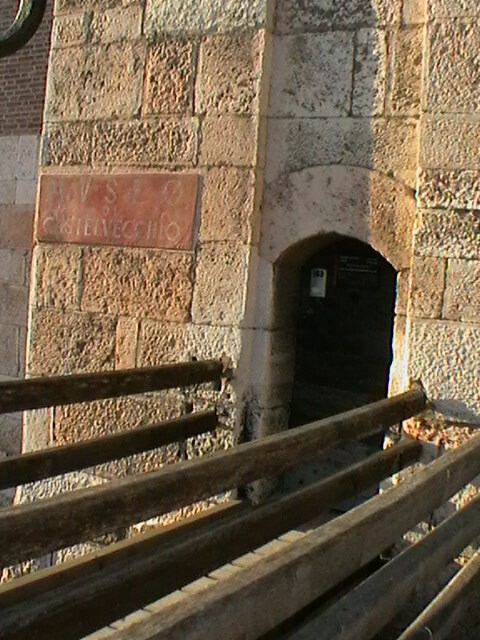 Some time ago, a visit from a friend brought me to the entrance of the medieval castle that was once the palace and fortress of the ‘Magnificent Lord’ (Magnifico Signore): Cangrande II Della Scala. 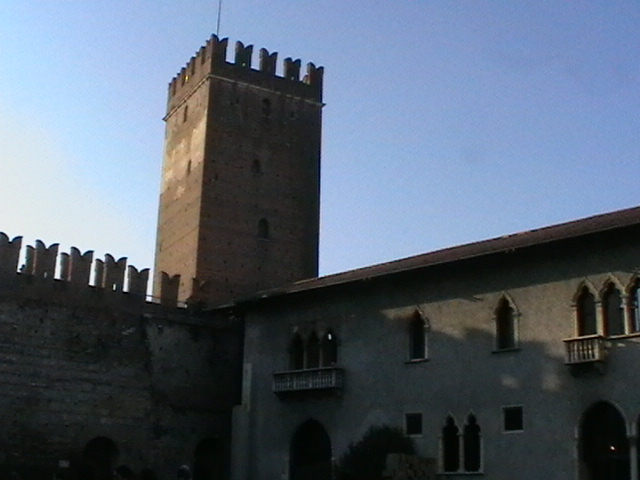 Today, Castelvecchio—literally, ‘Old Castle’—is Verona’s civic museum, yet its story is one punctuated by wars, occupations and liberations. Built during the mid-1300s by the Scaligeri family, then the lords of the city, the castle served to protect Cangrande and his family against popular uprisings. 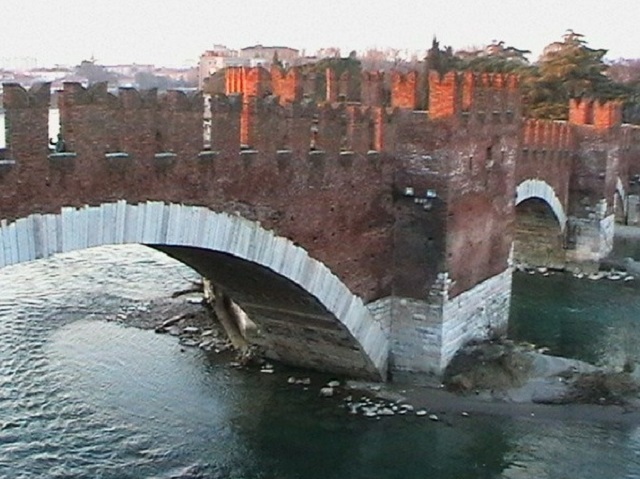 The structure’s greatest strength was its crenellated bridge, designed to allow Cangrande to escape quickly to the countryside if the castle were attacked. The castle’s fame faded with that of the lords, becoming an obsolete, fragile place. Used as a barracks under both Napoleon and Austrian rule, the Fascist government decided to convert it into a museum in 1923, but the Second World War interrupted the project. In 1945, Nazi troops blew up the bridge during their escape, but in 1958, Carlo Scarpa undertook the restoration of the site and gave Castelvecchio a second life. An expert in museums, Scarpa immediately realised that the late-Romantic fashion of the early 1900s had affected the authenticity of the medieval remains, without preserving the identity and history of the castle. Scarpa therefore chose to abandon the arbitrary works of his predecessors and created one of the first, truly modern museum itineraries, capable of providing a dialogue with the various works. He also decided to highlight the restored sections, pairing original gothic architectural features with contemporary architectural details. Ancient materials, such as stone and wood, are thus seen alongside concrete and iron; all in accordance with a geometric plan involving orthogonal grids that Scarpa modified from the works of Mondrian and Klee (painters for whom he had handled multiple exhibitions). I saw this form of ‘architectural shell’ created by Scarpa to highlight the uniqueness of the old in the museum’s first room: the medieval statues by the Master of Santa Anastasia are located in a sober, uniform space, punctuated by the intersections of the straight lines formed by the ceiling beams and the square paving. Everywhere I look, medieval details and architecture of the mid-1900s are juxtaposed harmoniously, combining the Spartan rigour of the castle with Scarpa’s abstractions. 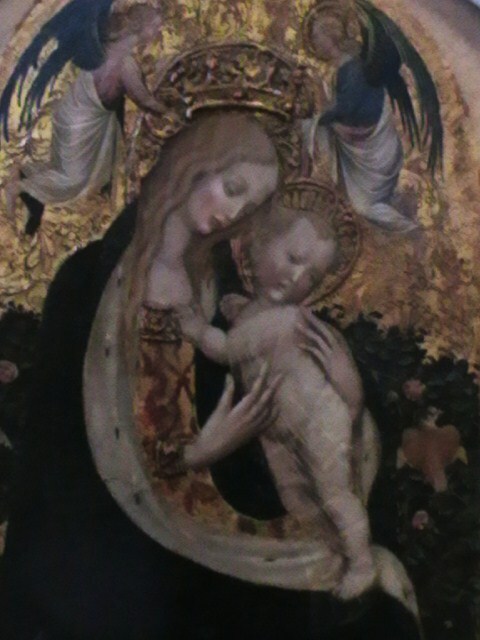 On entering this intriguing labyrinth, I discover one of the museum’s treasures: the Madonna of the Quail by Pisanello, a masterpiece of gothic medieval painting. 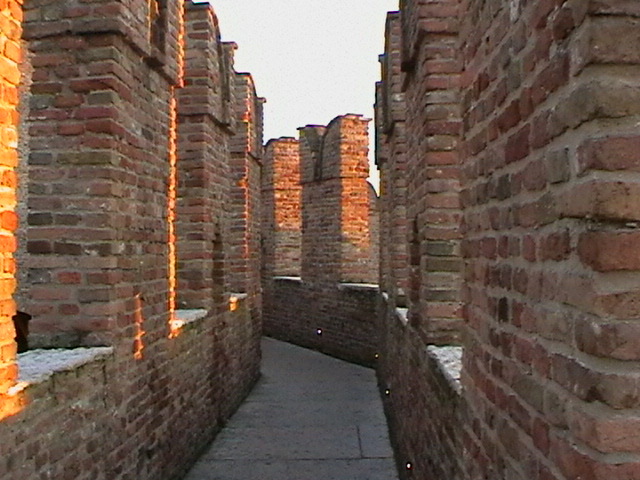 The path continues, alternating between the palace’s internal rooms and walkways alongside the walls, in a tangle of medieval corridors and concrete stairs. I walk outside, along the crenellated corridor facing the entrance courtyard, and along the covered path above the riverbank. Before me, I see the same landscape of hills and spires that I have just admired in the paintings of medieval Veronese artists. I descend Scarpa’s famous offset stairs carefully, and here I stand before him: Cangrande II Della Scala, immortalised in stone like the purest of cavaliers, self-confident, with a sly grin. 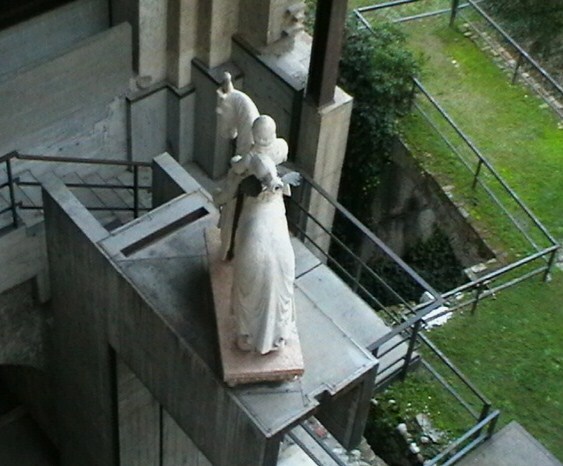 Scarpa decided to place this sculpture on a concrete plinth seven metres high, creating an apposite niche that allowed the work to be seen from multiple angles. 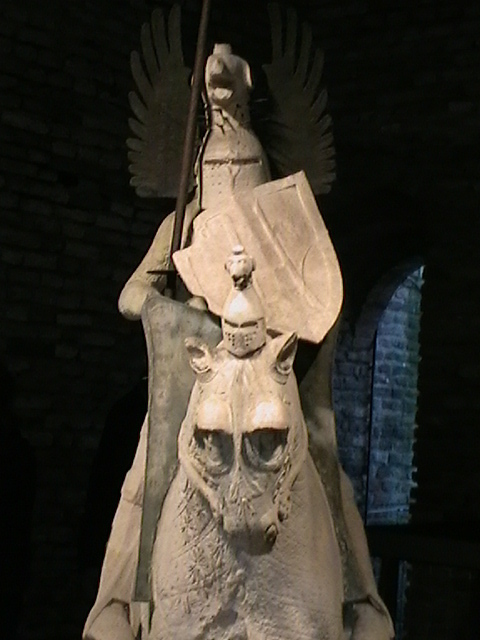 On the opposite side of the castle, facing Cangrande, looms the statue of another Scaligero: Mastino II. Hidden within one of the towers, the work is supported by a suspended pavement that makes it easy to see the modern restoration, and the original structure of stone and brick. With my respects paid to the Lords of Castelvecchio, I proceed towards the other marvels, like the Portrait of a child with drawing, and the Portrait of a young Benedictine monk by the Renaissance painter Gianfrancesco Caroto, as well as the works by Jacopo Tintoretto, Tiepolo, Longhi… and yet, on leaving the drawbridge, I continue to look around me for that “magnificent lord”, who chose for himself the image of a fierce dog, and for his refined court, the company of Dante Alighieri. The Castelvecchio Museum’s ticket office is open from Tuesday to Sunday, between 08.30 and 18.45; on Mondays, the museum is only open in the afternoon, from 13.30 to 19.30. The full ticket price is € 6. Giulia Zanoletti is a freelance journalist who has lived in Milan and Rome writing about cinema, theatre, and opera. With an eye for guerrilla marketing, she loves Italian culture, French cinema, and British irony. 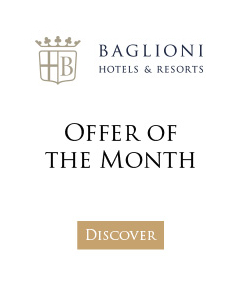 Concierge tip: If your day of culture in Verona makes you hungry, why not spend the evening in Venice (just an hour’s drive away) enjoying the secret recipes of Chef Cosimo Giampaolo with a sumptuous dinner at Canova restaurant.